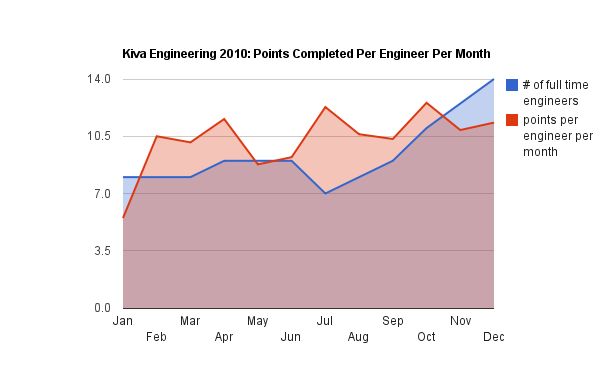 2010 was a year of growth for Kiva Engineering. We started the year with 8 full time engineers (and 2 managers) and ended the year with 14 engineers - a growth rate of 75%. We also kicked off 2010 with a switch to a new ticket tracking system (Redmine), that allowed us to more accurately track exactly what we've been up to. Let's take a look shall we.... Kiva Engineering is an Agile shop, operating roughly on a traditional Scrum model with two week Sprints (we call them "iterations"). We use "tickets" to track both defects in the existing product, as well as tasks for new development. Tickets are created by customer service, other Kiva staff members, our product managers and ourselves. 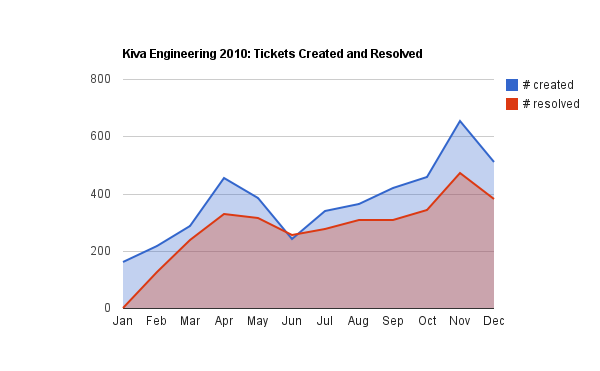 Here we show the raw number of tickets created versus resolved. My take away... there will always be more to do then we can possibly get to! Although demand for our services contains to outpace our capacity, we do continue to get more work done as time goes by. At Kiva, we track work in "points". Points are a unit-less measure of work that we use to measure how hard we think a task is (estimated points) and how hard it turned out to be (actual points). Like most Agile evangelists - we shy away from giving a rough conversion of points to hours. 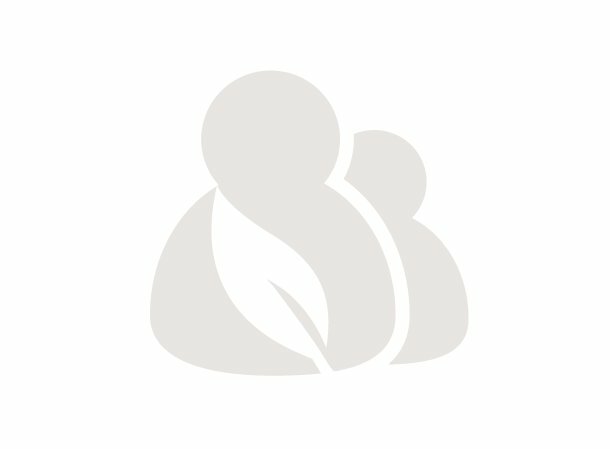 Engineers new to Agile find this strange and a little frustrating at first, but everybody seems to full into agreement within a month or two. 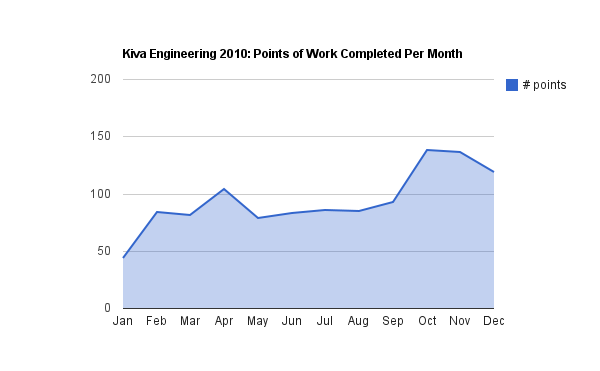 This second chart shows the number of points of work completed per month. Overall, this has been on the rise - no surprise since we've also been growing the team! Which brings us to the third and final chart - the one which best captures our efficiency as a team. This chart shows the points completed per coder per month. This chart also tracks how the number of coders on the team has evolved. Although it is clearly expected that we complete more points as the team grows, it is less expected and pleasing that our points per coder is also gradually rising. This means that despite the continual on-boarding of new team members and the increased "noise" of more bodies in the office (more emails, more questions, more dogs...) we're also continuing to get more efficient. Time will tell if we can continue this upwards trajectory as we continue to grow. (Did I mention that we're hiring...?) Note - in the final chart December was calculated as a 3-week month - a minimum estimate of the time we each took off to spend with our families over the holidays.